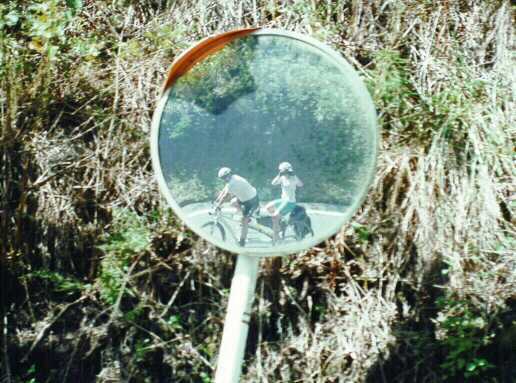 Nihon no Tandem (if my Japanese is close to correct) means Japanese Tandem. We are still successfully using the tandem here. Last weekend we went exploring a little to the north, toward the mountains. We went to a town, which is in the mountains but is actually not much of a climb since it is along a river. This town has a big festival next weekend and we decided to scout it out to see if riding to the festival would be feasible. The roads are fine; it is the nighttime navigation that concerns me. 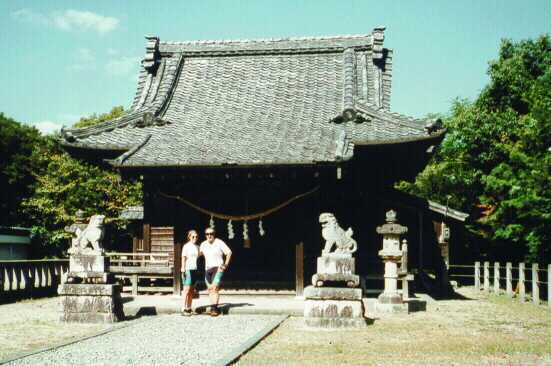 While at the town, Mori Machi, we went to look at one of the large shrines. As we were getting ready to get back on the tandem a group of older women approached us and started talking to us. They spoke no English and our combined knowledge of Japanese is about 100 words. However we did manage to tell them where we were from, where we are living, that we are married, our names, etc. We asked them where we could get lunch and they suggested the local grocery. We made a wrong turn (down a 10-foot dead end alley!) as we tried to leave, so one of the women led us to the main street and showed us how to get to the store. 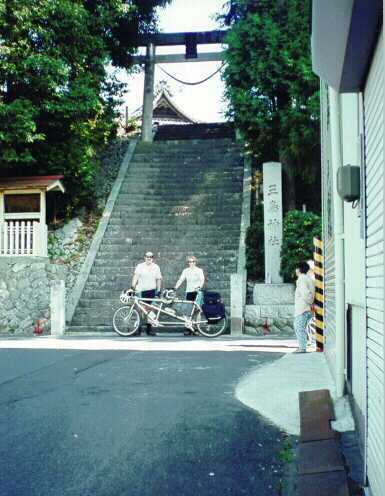 We picked up some prepared foods from the 'deli' and went back to the steps of the shrine to eat (shade was nice). Just as we finished the women who directed us came back and started talking again. We politely agreed when it seemed appropriate and were able to understand some things. It is amazing how even when we obviously don't understand, they keep on talking to us. We all try very had to be understood. We all said good-bye and we got on the bike to go. Just then the woman came running back to us from her house (which was across the street) and gave us three persimmons for the ride home. This was very nice gift (they sell for $3 apiece in the store). We took a different route home, made a few wrong turns, and did some hill climbing. 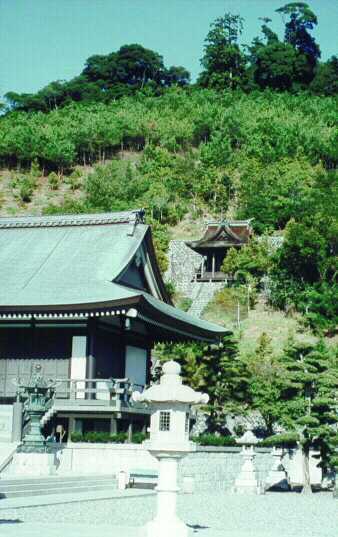 At the top of the hill was a big Buddhist Temple in which we went exploring. It is a large complex complete with the usual tourist type restaurants and gift shops. We did have to pay the same $2 to park the tandem that the cars do. Also on the ride we caught up to a group of four junior high boys riding home from school. This was on a hill, and we all stopped for a red light. Two of them sprinted out of the light, I think to try and stay ahead of us. We quickly caught and passed them. It was actually easy since we were in our small ring and they were on single speed bikes. It is amazing the hills that these kids can do on their one speeds, though it does make you wonder what their knees will be like. To add to their work, they were also wearing the school uniform, which consisted of black pants and a matching suitcoat. It was sunny and in the mid to upper 70's. We were comfortable in shorts and mesh jerseys! Poor kids. We had good rides both days, about 35 miles each. We have noticed that our average speeds here are 10-20% lower than in the states. I think it is because of the more frequent stops at intersections and the slowing down for sharp, blind corner, turns. So we allow more time for trips and have fun. 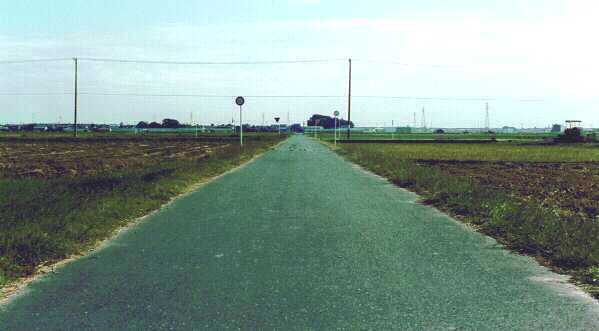 Speaking of UFO's, as we approach our little neighborhood, we go through a straight section of road about 1.2KM long that has several intersections. In the rural areas they have blinking red lights (sort of like vista lights) embedded in the pavement at the center of each intersection. These alternate in which direction they flash. As we go down the road at night heading toward about five intersections with lights, it feels as though we are a jetliner approaching the runway coming in for a landing!